I thought we had a thread for these, but could not find it. If someone can find it, then share it here and I will merge the two together. As the title says "US Slogan Cancels", Please share them here. Thanks! Slogan - "Air-Mail Saves Time"
Scott# C42 - Post Office Department Building. Issued Nov. 18, 1949. Slogan - "First Day of Issue International Trade Mart Station"
Scott# 775 - Michigan State Seal. Issued Nov. 1, 1935. Slogan - "Red Cross Roll Call -Join-"
Scott# 1057 - Statue of Liberty. Issued Oct. 1956. Slogan - " Strike Back at Cancer -GIVE- American Cancer Society"
Scott# 1097 - Marquis de Lafayette. Issued Sept. 6, 1957. 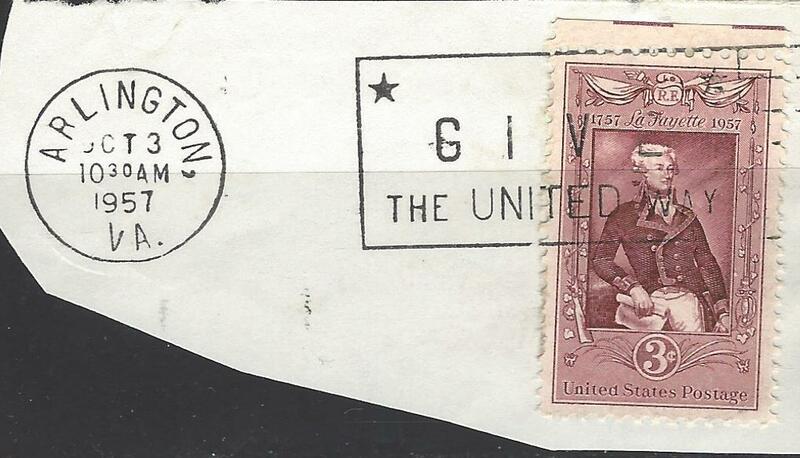 Slogan - "Give The United Way"
Slogan - "Address Your Mail to Street and Number"
Slogan - "Louisiana Purchase 150th Anniversary 1803-1953"
Scott# 543 - Washington. Issued May 1921. Slogan - " National Council Traveling Salesmen Sept. 5-6-7 Atlantic City"
I just got temporary possession of a bunch of old slogan cancels. There are so many of them!!!! Here are two types of AIRMAIL SAVES TIME cancels. EDIT: One might ask "How late were bi-plane cancels used and how early the mono-plane types?" Here is one that could well be used today. "KEEP CALIFORNIA GREEN"
This one in combination with others tells a story. How did someone get a FDC on a "too small to mail" envelope. Presumably a special request at the Washington DC post office. Keep your eye out for a "Keep America Great Again" cancel. I'm sure it's just a matter of time before it hits the mail system. Note: I mistyped the above slogan. It should read "Make America Great Again". I was, of course poking fun at all the "red hats" of your leader. In my opinion America has always been and will always be great. My sister was living in Nebraska for years and my daughter lives in Texas. She thinks it's great there. A little hot compared to here but still great nevertheless. That's why we have air conditioners.
? (community chest?, red cross?) I also have a community chest slogan that includes the same feather design. PS: all of these cancel appear to be machine cancels. For an introduction to some of the different types of machines used visit the following sites. You are correct in the assumption that the slogan pertains to Community Chest. The National Association of Community Chests, which is today the United Way of America, was established in 1927, and in 1947 gave their first Red Feather Award to former General Electric president Gerard C. Swope. According to a 1953 Life magazine blurb, the symbol of a feather has stood for virtue and good deeds since the days of ancient Egypt. The National Association of Community Chests, which encouraged contributions to help those less fortunate than oneself, gave the red feather award to those who donated to their community chests. The slogan "Wear Your Red Feather Proudly" means to be proud of the fact that you have helped others through your contribution.